I've been to DragonCon a few times, and it's always more fun to go in costume. The convention is a four-day cosplay party, in addition to all the workshops and panels it offers. My costumes have been pretty easy to assemble by design. No sewing was required because "no sewing" is what I bring to the party. In 2011, I went as Shipwreck. 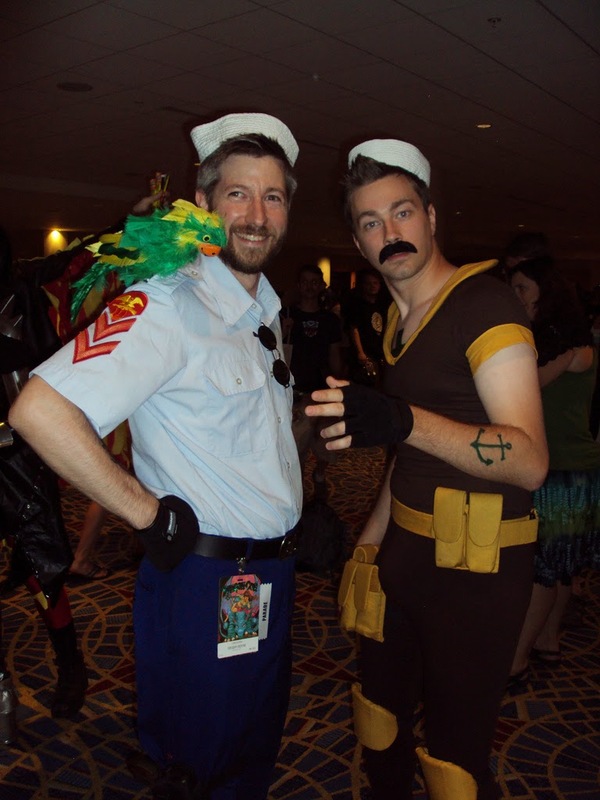 I ran into Shore Leave from Venture Brothers, and, for me, this is the photo of that year's show. 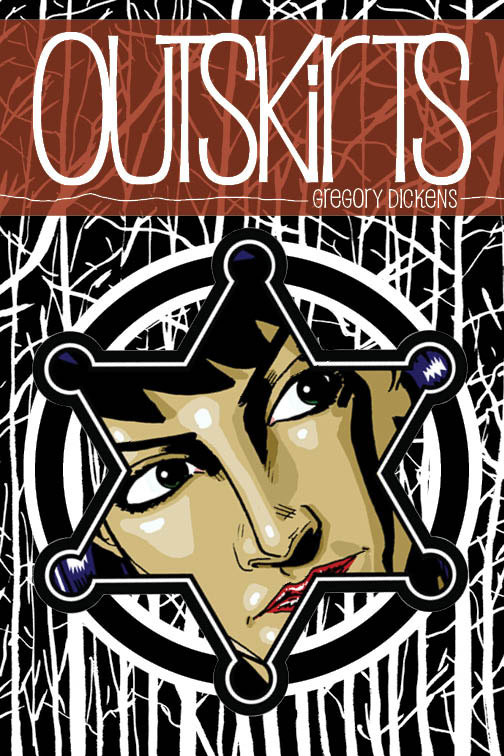 The patch was ironed on, and the clothes were found at surplus stores. Making the bird was the hardest part, and that took maybe an hour. That's nothing. Compared to the cosplayers who spend hundred of hours on their costumes, my effort is meager. 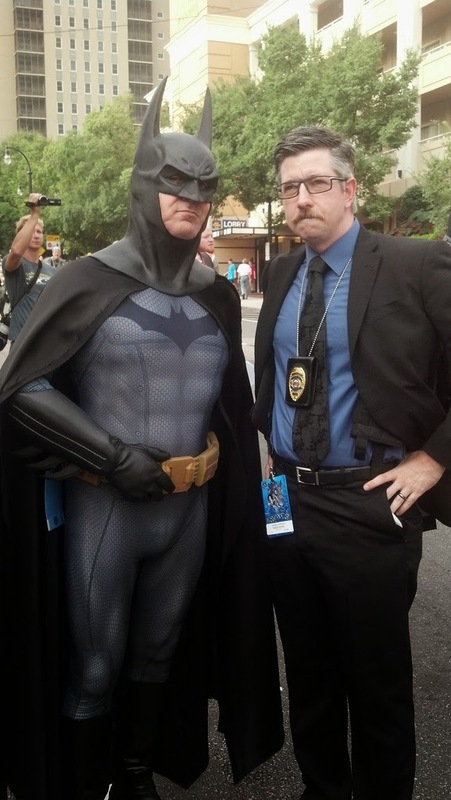 I did even less for the 2012 and 2013 costume: Commissioner Gordon from the recent Batman films. It's a suit. All I did was shave. Basically, the costume is my face, and that's sheer coincidence. People asked if I at least had to gray my hair. No. I didn't even have to do that, says the old man (dressed as Oldman). But the oddest thing happened last year. 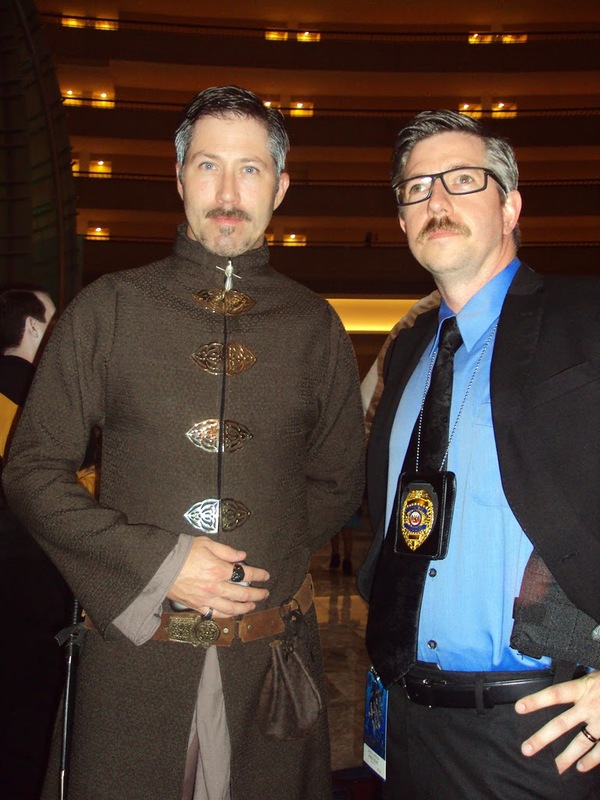 People came up to me and said "you have to dress up as Littlefinger." And, of course, I said, "who the *!#% is Littlefinger?" Some folks even found a Littlefinger for me, and, based solely on this guy's presentation, I had to admit, yeah, they got a point. Then I had to figure out how I could do that. Well, first, I had to watch some Game of Thrones then I had to figure out how I could do that. 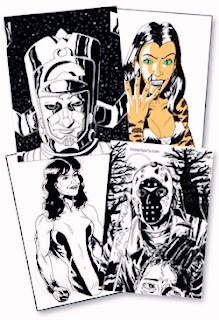 I Googled a photo of the character for my wife, and she said I was a dead ringer. Again, sheer coincidence. But it's handy for me, Mister No Sew, the costume cobbler. 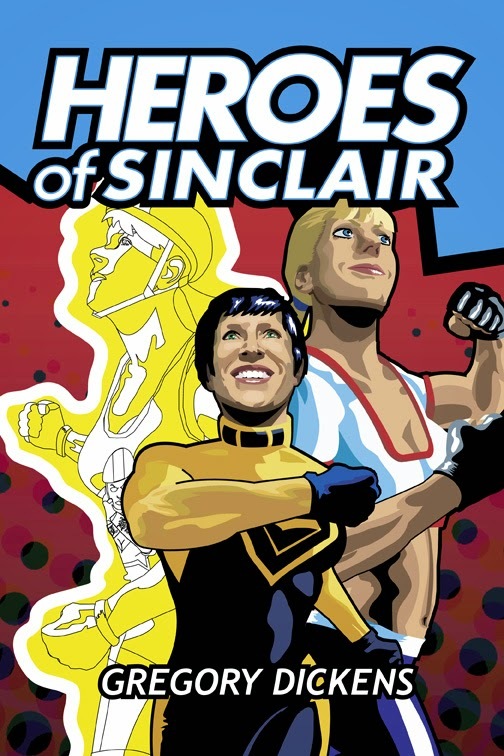 Once more, my face will be the costume. 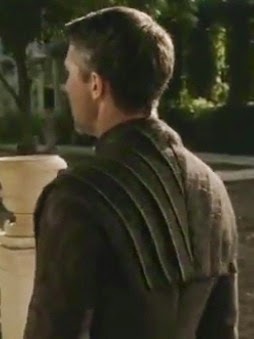 I don't have to be so faithful to the Littlefinger clothes to sell the cosplay. 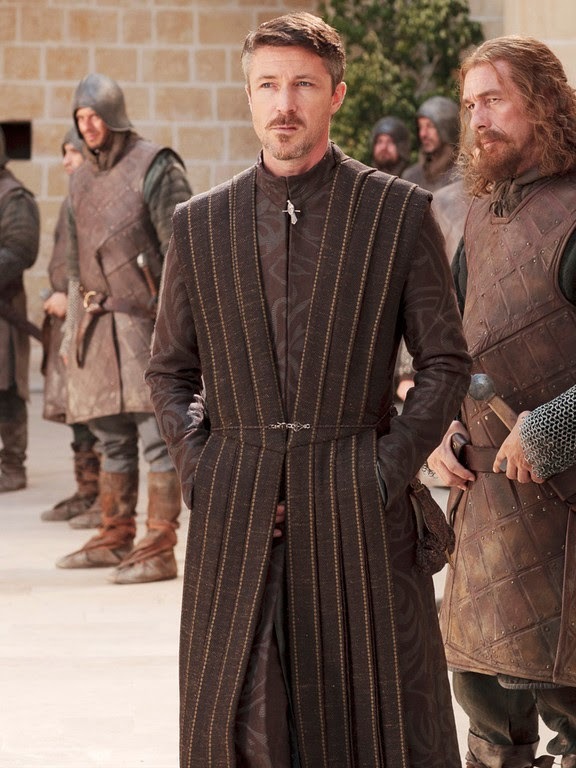 When you Google Littlefinger costume reference, this outfit comes up the most often. Yeah, I don't think I can do that. I learned how to cross stitch in seventh grade (the same class that taught me how to bake), but that dusty set of skills seems inadequate for this. So if I can't duplicate the outift, how can I approximate it? Since we're now abstracting, let's consider the practical matters. That outfit is gorgeous. That outfit looks like it weighs quite a bit. Stout, layered material. They film this show in the northern United Kingdom and Iceland. I will be in Atlanta. In September. Amid 40,000 people squished shoulder to shoulder. The first thing I can do is work with thinner materials. Then I can see about suggesting the costume in the simplest ways. I shopped online for the base layer, which would be the hottest, and settled on a Matrix Neo coat from a costume retailer. I didn't get the expensive models. I went cheap. If I work with the coat and ruin it, I can order another without freaking out. I can also play with it knowing a replacement is handy and affordable. It's nylon, and even I know it won't accept a dye to get that pattern we see above. Again, I'm approximating. So, for now, bottom layer done. Let's work on that Celtic poncho. Let's (Google fabric store, find the local shops, plan my trips during lunch breaks, try not to embarrass myself) go to the fabric store! Yesterday, I went inside the first store just to take it in. I had no intention of buying anything. That will come after I see what all my options are. I know I am starting from the ground floor so my first reactions to the inventory will be quaint and wrong, you expert cosplayers. I have zero illusions of matching your product and skill sets and experience. I salute your work, and I am constantly delighted to see what a knowledgeable set of hands can craft for these shows. Truly astounding. Me, I just want to get through one day. Unless my finished product (clothes + face) is a hit, I'll shuck and shave and dress up as Gordon for the second of my two days in Atlanta.I've never taken two costumes to DragonCon. If my Littlefinger doesn't work, I can be Gordon in 15 minutes. That takes some pressure off. 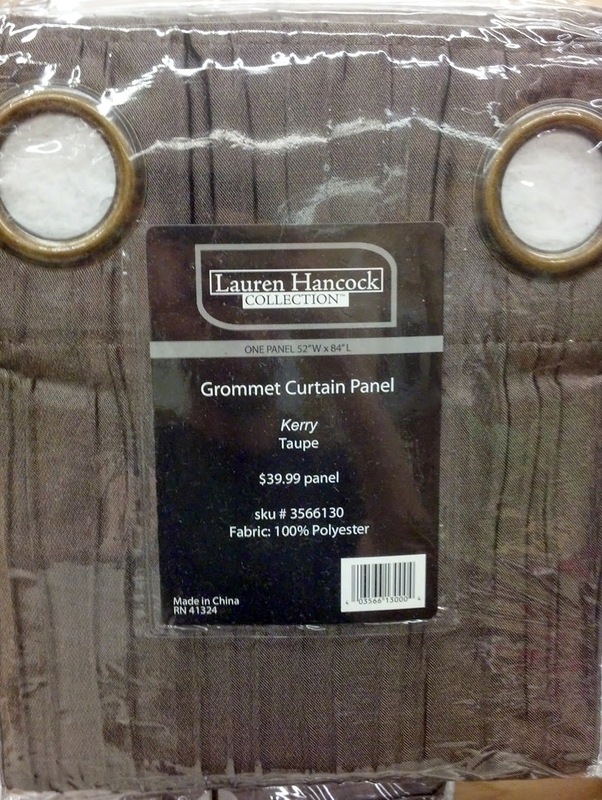 Hey, what if I use a shower curtain for the top layer? Maybe not this one. It has too many folds, but the texture and color aren't bad. Already I'm considering alternatives to yards of cloth bought from a bolt. That's good. At this level, I'm just brainstorming. I'm Iron Chef Cosplay. Oh, but that top layer turns out to be screwy. It isn't symmetrical. Well, crap. I thought I could just drape the Celtic poncho upon my lucky shoulders. HOW EASY IS THIS COSPLAY! HOW VICTORIOUS I SHALL BE! No. Maybe I should cheat and just drape it at equal lengths in front and back. And maybe I will. But for now, let's play this out. How would I do this? I could probably sew the top layer to the back of the Neo coat. A thin layer wouldn't tear the coat like a heavy material would, and it would make the back of the costume cooler to wear all day. Let's put that on the back burner for now. The larger concern of the layer is the gold accent. It looks like lots of gold dots. How can I fake that? I found some ribbony ribbons that might work. OK. Those are new options. What else? 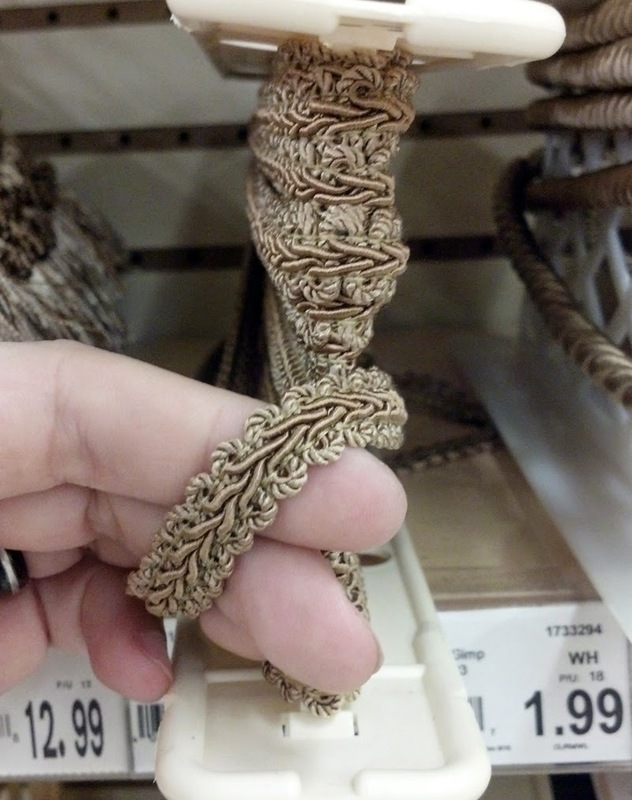 String trim perhaps. OK. What else? Well now. This could be handy. I like the idea of this texture on the clothes, but the color seems too bright. But not bad. 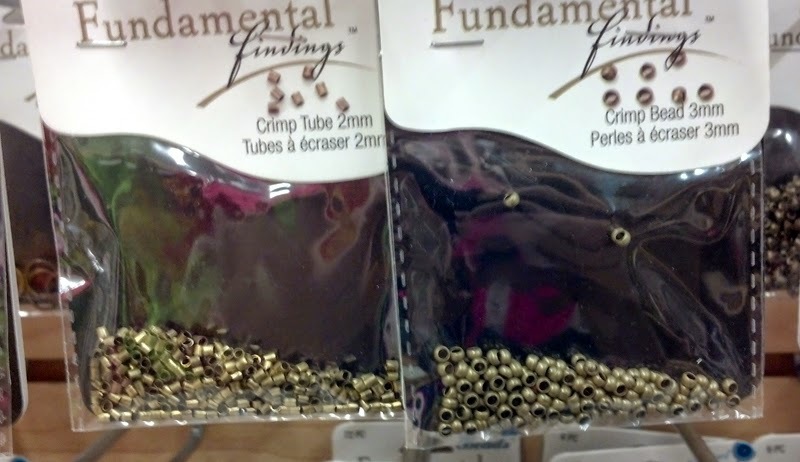 Oh hey, something called spacer beads. 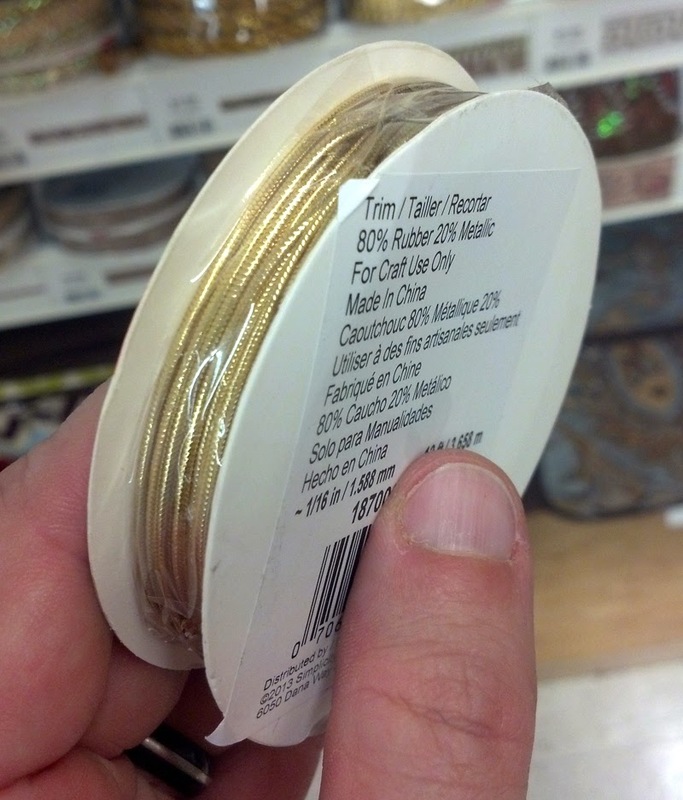 Slide them on a gold thread and sew the line to the fabric? Hmm. 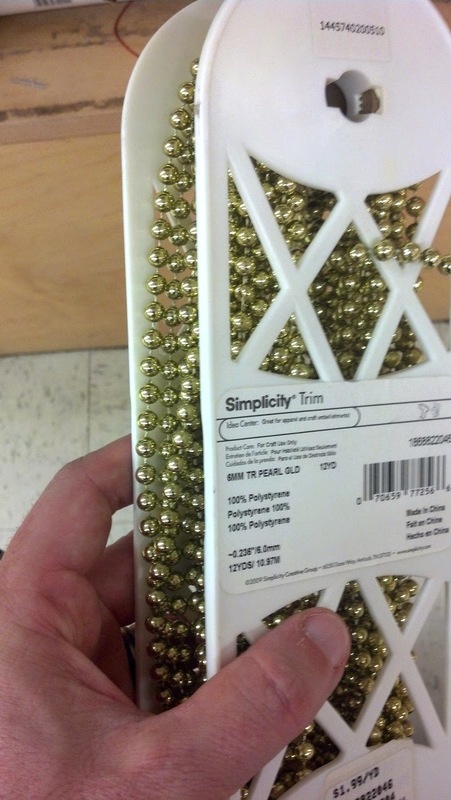 That might take a lot of beads. That could get heavy too. What I didn't find in the fabric store was dye. Any kind of fabric paint at all. (I also was not asked once if I needed help even as I took a dozen+ pictures and lapped the store numerous times. Maybe it was because I was a guy. 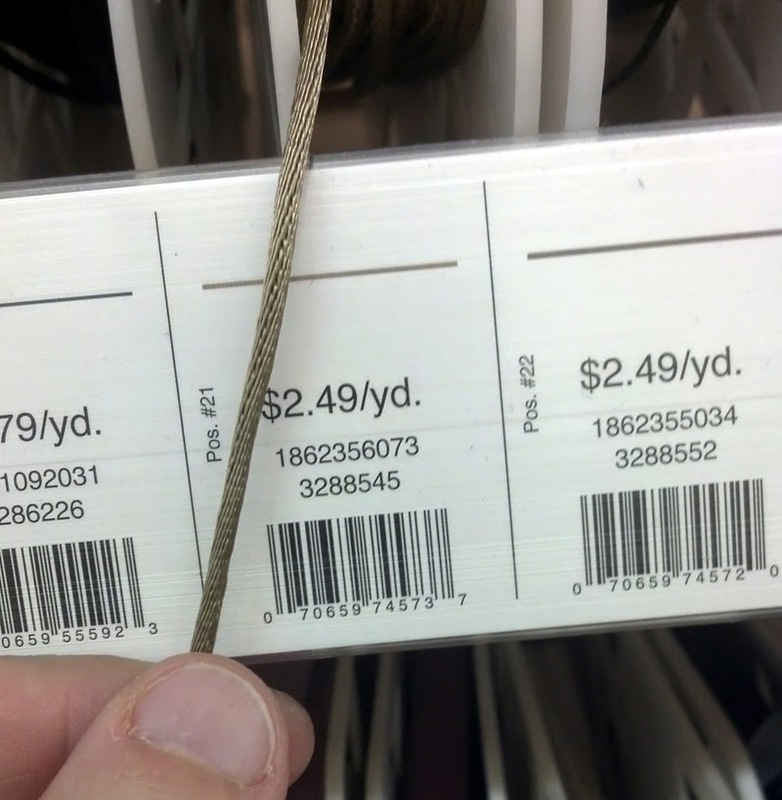 I have the same isolation when I shop for my wife's clothes.) 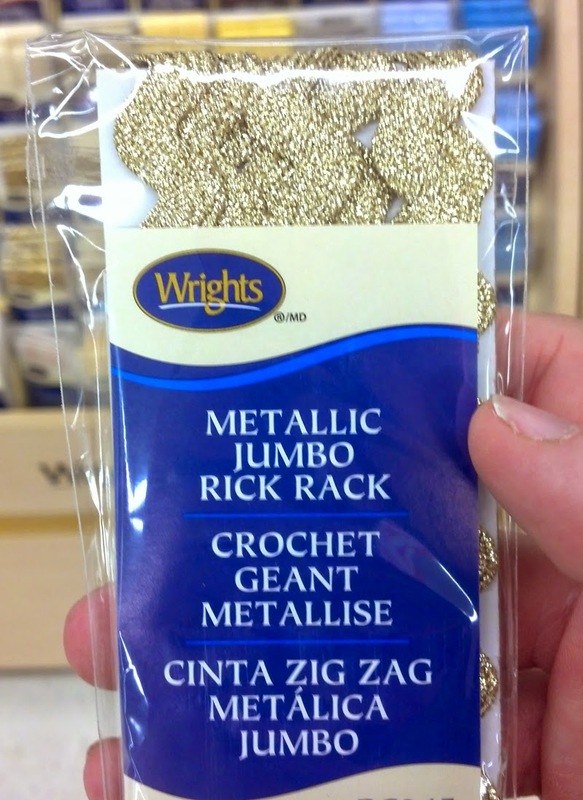 I wondered about just putting gold paint on the poncho. I could dab a pencil eraser in the paint and make those rows in like an hour, right? 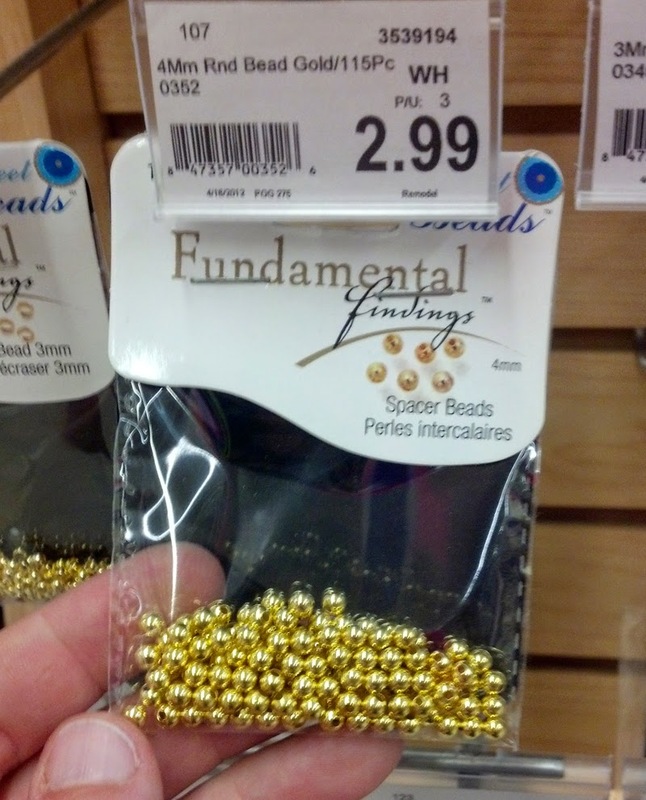 I wouldn't have to worry about the thread or beads or string coming undone. Yes. Yes, I like this idea. 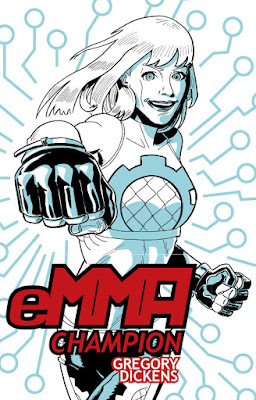 I already ordered a mockingbird pin, and I'll need to find that thin belt. But those are details, and they can wait. For now, I feel pretty good about the more significant components of the costume. And that's just after one trip to one store. VICTORY MAY YET BE MINE! Or I might dissolve into weeping nihilism. It's fifty-fifty at this point.